What is a rat show? Which rats should I enter? How do I prepare my rats for the big day? What happens after the judging? Rat shows are a great place to meet fellow rat lovers and to find out more about rats. They are the ideal starting point if you are interested in keeping pet rats and want to know more about them, and to meet breeders. At each show you will find classes for pet rats and varieties rats. At YRC shows, and those of some other clubs, there are also rat agility competitions. 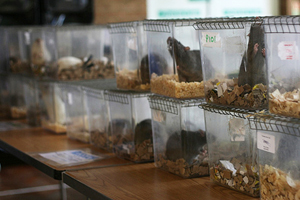 Rats are judged on several points but all rats entered should be fit, healthy and in good condition. They should also be happy to be handled by the judge and have a sound temperament. In varieties your rats will be judged against a written set of standards of excellence. The YRC use the NFRS standards, copies of which are available via www.nfrs.org. The nearer your rat is to the standard described, the better. Varieties judges will either be fully qualified NFRS judges, or people undergoing their judges training. Please note that neutered bucks cannot be shown in varieties. In pets the markings, colour etc. of the rat is of less importance. Pets are judged on friendliness, health, condition etc. 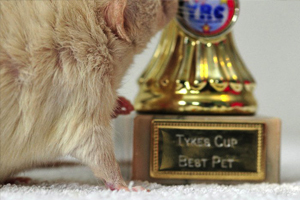 Pet judging is more subjective as every judge will appreciate different qualities in a rat. Pet judges are usually drawn from the club membership and will be rat lovers. There are no set standards for pets but guidelines are available. If you would like to have a go at pet judging please speak to our show secretary. In agility speed is all-important! The rats go round a course of wooden obstacles (aided and abetted by you of course) and the fastest wins! Details of how to enter the next show are available here. Entries usually close at 9 pm on the Wednesday before the show. If you are not sure which class to enter just ask when you make your entries. Payment of entries is made on the day of the show to the show sec in cash. There are lots of different ways to prepare your rat for a show. The best thing to remember is that the preparation does not start the week before the show. Diet, health and good husbandry all contribute to keeping your rats in tip-top condition and these should be ongoing, whether the rat is going to a show or not. Bathing: Many people choose to bathe their rats a few days before a show (it can strip the oil from their coats so it is best not done too close to show day). Some rats like it, others do not! Use warm, not hot, water, a good pet shampoo and make sure it does not get in their ears or eyes. Rinse the coat well after shampooing and then towel dry. Ears/eyes: You can clean these using a small pet safe wipe or a cotton bud dipped in water. Claws: You should trim your rat’s claws before a show. Judges do not appreciate going home covered in scratches, and if you have not trimmed their claws it could count against your rat when it is judged. Use a nail clipper to take off the sharp ends, but be careful not to cut into the quick or the rat will bleed. If you would like a demonstration please ask at a show and someone will be pleased to help out. For the very faint hearted someone at the show is usually happy to trim claws before the rat is benched, but it is best done a few days prior to the show in order to let any scratchy edges smooth off. Tails: Tails should be cleaned prior to a show. This can be done when the rat is bathed by wiping with a flannel, scrubbing gently with a soft toothbrush or by wiping with baby/animal wipes. A dirty tail will go against your rat when being judged. Check your rat the morning of the show and do general tidying by wiping the tails, ears and eyes if needed. You can also use grooming/baby wipes and small brushes to ensure your rat’s coat is at its best. Show tank: A limited number of tanks are available to hire from the YRC at a cost of £2.00 for members and £2.50 for non-members. Please book one when you enter your rats. You can also use your own show tank if you have one. The aim is for all the tanks to look similar so that the rat’s owner cannot be identified by the tank. You can also buy tanks from us at £13 these need to be pre ordered and picked up at the show. Substrate: Rats may be shown on any brown or beige substrate, providing it is safe and clean and no more than 5cm deep. Substrate can be provided with the hire tanks or you can use your own. A moisture source: Your rat will be in its show tank for several hours on the show day, so you must make sure that it has some source of moisture available as water bottles are not allowed on the show bench (except at outdoor, tented shows). The moisture source must be either apple, carrot or cucumber. It is a good idea to have a water bottle handy for the end of the show so that your rats can top up their hydration levels. Your rat needs to be benched at least 15 minutes before judging is due to start, so aim to get to the venue in good time. On arrival go and see the show secretary who will give you your stickers. Adult rats must have a tank each, but kittens may share a tank with either another kitten being shown, or a non-show companion. If you do this please make sure that you put 2 distinct varieties in the same tank so that the correct rat gets judged. Labels should be stuck in the top right hand corner of the narrow end of the tank and the opening end of the sliding lid should be at the sticker end of the tank. Once your rat is ready to be benched, place the tank on the appropriate table (varieties or pets) and the steward will make sure it goes in the right place. Once judging starts only show officials are allowed in the judging area, but you may watch the judging from the outside of the tables. Make sure you do not do anything that lets the judge know which rats are yours! Once judging is complete you will be invited to collect your rats. If your rat has been placed in its class you will see a sticker on the label (1st – red, 2nd – blue, 3rd – yellow, 4th – green). Further stickers indicate placings in group classes, such as adult marked, marked, adult challenge and overall challenge. At the end of the show, presentations will be made and rosettes, cards and critiques given to the winners. Critiques are available for each rat in varieties, whether they are placed or not.